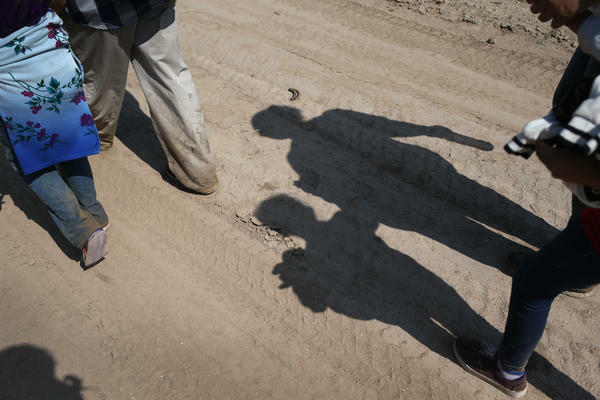 Central American immigrant families walk after crossing from Mexico into the United States to seek asylum in Texas. 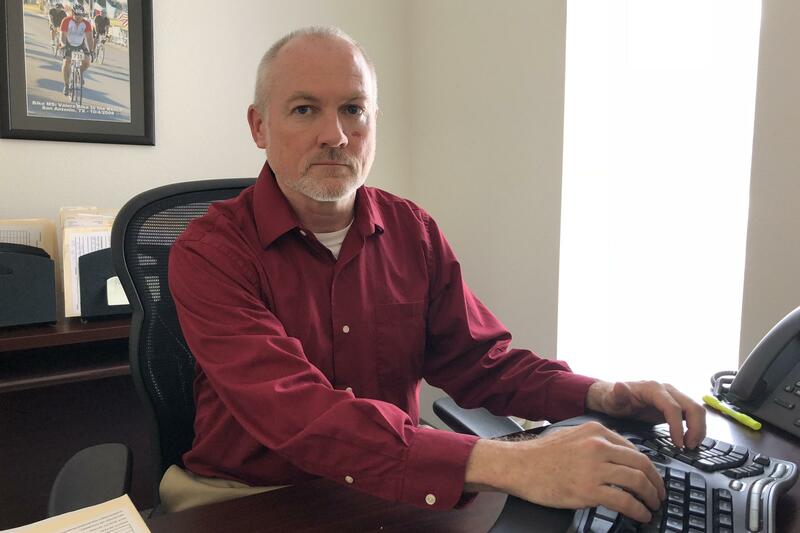 Chris Carlin, supervisory attorney in the Federal Public Defender office in Alpine, Texas. Three young Guatemalan women went on trial this week at this red-rock federal courthouse in Alpine, Texas. 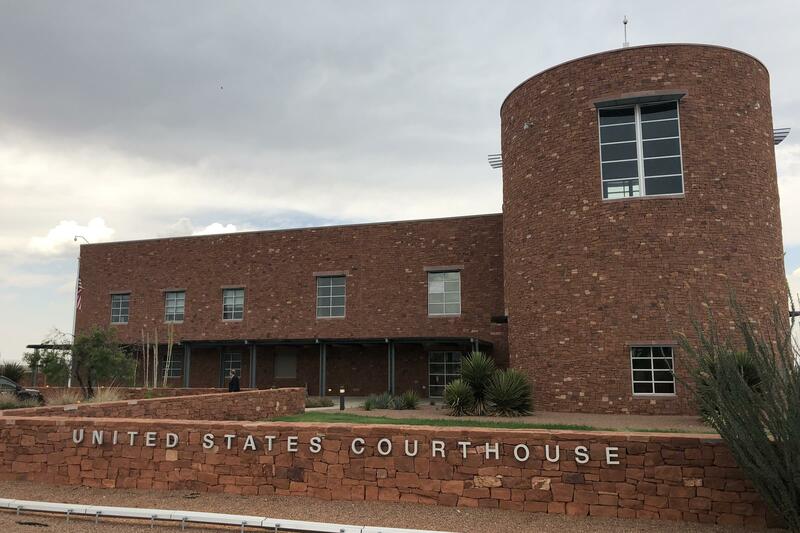 Three young Guatemalan women went on trial this week at the red-rock federal courthouse in Alpine, Texas. It's about 70 miles from the spot in the border town of Presidio where they waded across the Rio Grande three weeks ago, with their eight- and nine-year-old sons in tow. One of the women, Emilia Figueroa, testified during the trial that she believed if she brought her boy with her, the two of them would be released to live in the United States until their immigration court date. But, to their horror, the opposite occurred. Agents booked the Guatemalan mothers for unlawful entry and took their children away — to a shelter in New York City. Chris Carlin, the public defender handling their cases, said in an interview that he thinks this is all part of the Trump administration's mean-spirited plan to deter more unauthorized immigrants from coming. "The only thing that makes sense to me is to make it far more onerous to reconnect the adult with the child," Carlin said. "Why else would you do this? Why would you take a child from the desert of west Texas and fly them to Manhattan?" In courthouses up and down the U.S.-Mexico border, immigrant parents who crossed illegally with their children are facing a harsh reality. They will no longer be allowed to stay together, as a family. The parents are detained. And the children are transported to shelters, sometimes hundreds of miles away. Figueroa, Fidelina Pascual-Leiva, and Maria Santiago-Sanchez — the three Guatemalan mothers desperate to be reunited with their sons — are part of the biggest surge of undocumented migrants since Trump took office. Immigration agents arrested more than 50,000 in May — more than three times the number a year ago. At the same time, the government has vowed to prosecute every immigrant who crosses illegally, even if they ask for asylum. It's called "zero tolerance." The result has been an overflow of detainees — so many that the government is putting adults in federal prison beds, and looking at military facilities to house their children. In Alpine, the federal court docket has jumped 40 percent. Attorney General Jeff Sessions blames the parents. "We don't want to do this at all. If people don't want to be separated from their children, they shouldn't bring them with them," Sessions said on the Hugh Hewitt radio show earlier this week. "We've got to get this message out: if you come illegally and if you bring children, you'll still be prosecuted." None of the Guatemalan mothers had communicated with their sons, and they didn't learn where their children had been transported until Wednesday, according to Carlin. Each mother has one son. Aware of the widespread panic that family separation has caused, Immigration and Customs Enforcement says it has set up hotlines and assigned officers to help detained parents find their children who are somewhere in U.S. government custody. In court on Wednesday, the despondent, scared faces of the three defendants indicated they had clearly not received Sessions' message. They were dressed in tangerine-orange jumpsuits, shackled at the waist and ankles, and so short in stature that when they sat down their rubber jail slippers barely touched the floor. This trio of Mayan women asked for a trial before a judge. They wanted to explain the facts of their cases. Figueroa, an illiterate, 24-year-old housewife, testified that she fled her village when local thugs extorted her and threatened to harm her and her son. She says she borrowed $4,000 from family friends to make her way to Alabama to stay with an in-law. "This is the place where there is no violence, as there is in my country," she testified softly, in Spanish. Her attorney tried again and again to point out that these defendants are mothers and deserve leniency. But each time, the prosecutor objected, saying it was irrelevant in a criminal case. "In these cases," Carlin said, "in the three cases that you saw today, there is no mention in the Border Patrol narrative, that those women had a child with them when they entered the United States. Nothing." At the end of the three-hour trial, U.S. Magistrate Judge David Fannin was visibly moved by the mothers' predicament. "As painful as this may be," he said, "I find you guilty of the offense of illegal entry into the United States." He then declared their punishment was time-served for the three weeks they had been detained. Under the old rules, at this point, parents would be reunited with their children, released, and told to appear in immigration court. But Trump has vowed to do away with what critics derisively call "catch and release." So, under the new rules, these three women will be moved from a pre-trial cell to an immigration cell in the same lock-up. There they'll wait until their asylum claims are decided. "So all that will actually happen is they'll be, the color of their uniform will change from orange to green, and then they'll be in immigration custody," Carlin said. The judge asked the three diminutive women if they had anything to say. They shuffled to a microphone — ankle chains clanking, with U.S. marshals towering over them. Figueroa wept as she told the judge: "Thank you for listening, thank you for your kindness." Pascual-Leiva said: "I apologize for entering your country unlawfully." Then Santiago-Sanchez said, through tears, "When they took away our children we cried and cried. We were so sad." Carlin is not sure when or if they'll be reunited. This next story takes us along the U.S.-Mexico border. In courthouses there, immigrant parents who crossed illegally with their children face a harsh reality. They'll no longer be allowed to stay together as a family. The parents are detained under a new Trump administration policy, and the children are transported to shelters sometimes hundreds of miles away. NPR's John Burnett reports on the trial of three Guatemalan mothers desperate to be reunited with their sons. JOHN BURNETT, BYLINE: On Wednesday, these three young women went on trial inside the red rock federal courthouse here in Alpine, Texas. It's about 70 miles from the spot where Emilia Figueroa, Fidelina Pascual-Leiva and Maria Santiago-Sanchez waded across the Rio Grande three weeks ago. They were each traveling with a son. One is 8 years old. Two are 9. One of the women testified she believed if she brought her boy with her, the two of them would be released to live in the U.S. until their immigration court date. But to their horror, the opposite occurred. Agents booked the Guatemalan mothers for unlawful entry then took their children away to a shelter in New York City. Chris Carlin is the public defender handling their cases. In an interview, he said he thinks this is all part of the Trump administration's mean-spirited plan to deter more unauthorized immigrants from coming. CHRIS CARLIN: The only thing that makes sense to me is to make it far more onerous to reconnect the adult with the child. Why else would you do this? Why would you take a child from the desert of West Texas and fly them to Manhattan? BURNETT: These women are part of the biggest surge of undocumented migrants since Trump took office. Immigration agents arrested more than 50,000 in May, more than three times the number a year ago. At the same time, the government has vowed to prosecute every immigrant who crosses illegally, even if they ask for asylum. It's called zero tolerance. The result has been an overflow of detainees, so many that the government is putting adults in federal prison beds and looking at military facilities to house their children. Here in Alpine, the Federal Court docket has jumped 40 percent. Attorney General Jeff Sessions blames the parents. Here he is on the Hugh Hewitt radio show earlier this week. JEFF SESSIONS: No, we don't want to do this at all. If people don't want to be separated from their children, they should not bring them with them, especially - we've got to get this message out. If you come illegally and if you bring children, you'll still be prosecuted. BURNETT: The frightened, despondent faces of the three Mayan women indicated they had clearly not gotten the message. They were dressed in tangerine orange jumpsuits, shackled at the waist and ankles, so short in stature that when they sat down, their rubber jail slippers barely touched the carpeted floor. Emilia Figueroa, an illiterate 24-year-old housewife, testified that she fled her village when local thugs extorted her and threatened to harm her and her son. She says she borrowed $4,000 from family friends to make her way to Alabama to stay with a relative. Her attorney asked why she came here. This is the place where there is no violence as there is in my country, she replied softly in Spanish. Her attorney tried again and again to point out that these defendants are mothers and deserve leniency. But each time, the prosecutor objected, saying it was irrelevant. Again, defense attorney Chris Carlin. CARLIN: In these cases - in the three cases that you saw today, there is no mention whatsoever in the Border Patrol narrative that those women had a child with them when they entered the United States - nothing. BURNETT: At the end of the three-hour trial, Magistrate Judge David Fannin was visibly moved by the women's predicament. As painful as this may be, he said, I find you guilty of the offense of illegal entry into the United States. He then declared their punishment was time served for the three weeks they'd been detained. Under the old rules, at this point, parents would be reunited with their children, released and told to appear in immigration court. But Trump has vowed to do away with what critics derisively call catch and release. So under the new rules, these three women will be moved from a pretrial cell to an immigration cell in the same lockup. There, they'll wait until their asylum claims are decided. CARLIN: So all that will actually happen is they'll be - the color of their uniform will basically change. CARLIN: They'll go from orange to green, and then they'll be in immigration custody. BURNETT: The judge asked the three diminutive women if they had anything to say. They shuffled to a microphone, ankle chains clanking, with marshals towering over them. Ms. Figueroa wept as she told the judge, thank you for listening. Thank you for your kindness. Ms. Pascual-Leiva said, I apologize for entering your country unlawfully. Then, Ms. Santiago-Sanchez said, through tears, when they took away our children we cried and cried. We were so sad. Chris Carlin is not so sure when they'll be reunited. He said that none of the mothers have communicated with their sons or even knew where they were until Wednesday morning. Aware of the widespread panic that family separation has caused, Immigration and Customs Enforcement says it has now set up hotlines and assigned officers to help detained parents find their children who are somewhere in U.S. government custody. John Burnett, NPR News, Alpine, Texas. Transcript provided by NPR, Copyright NPR.